Delma (on the right), holds her tamborim in her first show with SambaLa in 2015. 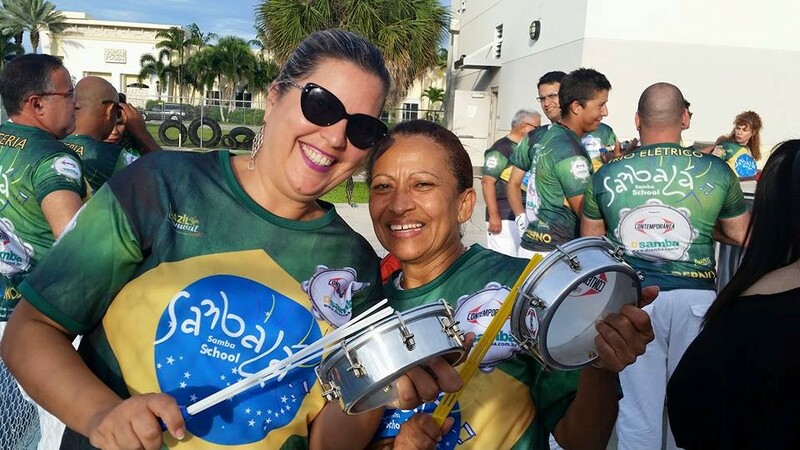 Last year, in 2015 during the SambaLá parade at the Brazilian Beat in Boca Raton Florida, one of SambaLá’s tamborim players came up to me in tears and said: “David, I realized a dream of mine today: to play in a samba school drum corps”. I didn’t expect that from this particular person. She had always been somewhat quiet and I never had any feedback as to why she wanted to play with the “bateria”. That person turned out to be Delma Santos, and amazing and giving person. Since that day, Delma has traded in the smallest samba drum (the tamborim) for the biggest, the “surdo” (bass drum). She has already played the surdo in numerous shows and a second big parade in Boca this year and has become an invaluable member of the SambaLá family. 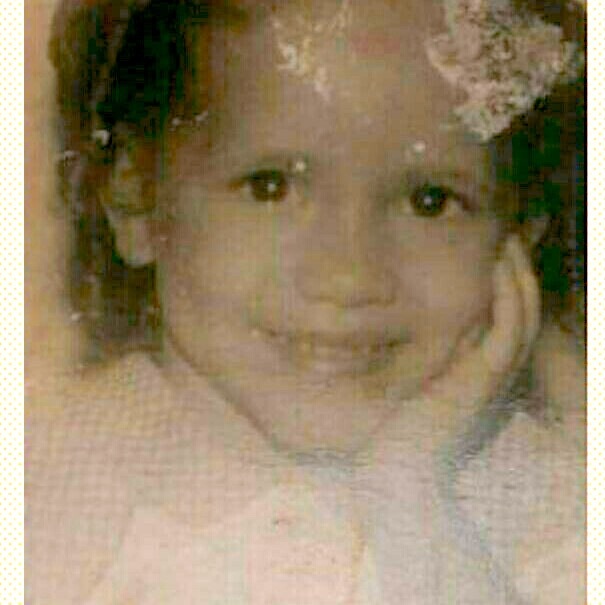 But her story starts back in Salvador Bahia, in the northern part of Brazil. 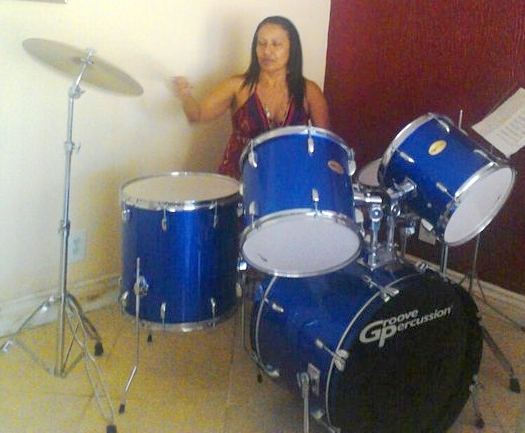 Born in Salvador Bahia, Delma had a normal childhood but always liked music and drums. Although she had a love of music, she didn’t play drums or music and ended up studying accounting. She got married and had two children and life went on. But, then adventure took hold. In 1996, Delma decided to come to the United States to learn English and eventually came back to stay, first in Massachusetts, then New Jersey, and finally Florida. Turns out that Delma didn’t like the cold weather so Florida was to be her home. During her stay here in the United States, her interest in drums started to grow with her even buying a drumset to play. But that didn’t go very far. She continued working in the garment business in Florida and putting her drumming dreams on hold. In 2015, Delma first saw a drum corp in action at a birthday party with a rag-tag bateria I threw together with my own instruments and some people who could play a little. It was a surprise party for a Brazilian lady who loved samba. At this point, SambaLá was still in California. Delma eventually asked where we were practicing and it turns out we started practicing in the spiritual center where Delma and Doris (my wife and show director) met and worked often. The only problem was, Delma was afraid of me, David de Hilster. 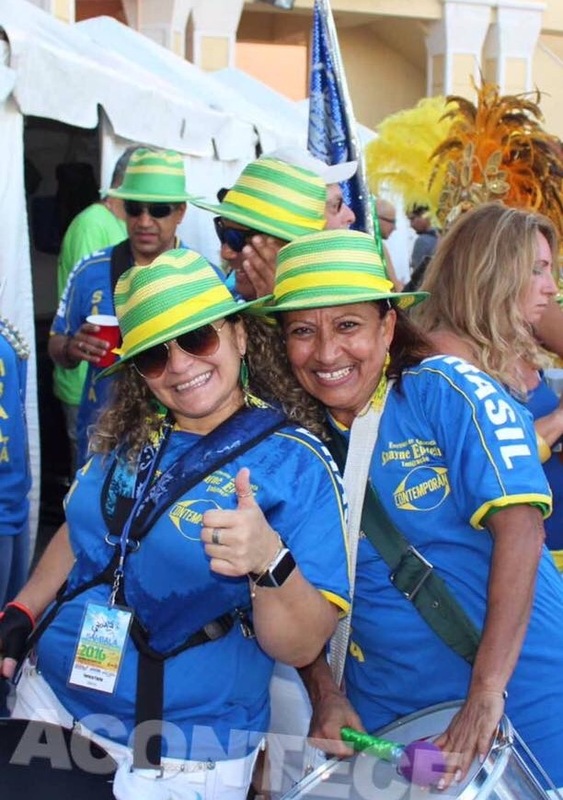 Delma (right) poses with her bateria buddy Tereza in the 2016 samba parade in Boca Raton. She has her new drum: the surdo or bass drum. I admit to being “colder” than the average Brazilian when it comes to interacting with people I don’t know. That is part of my personality. I’m more a “matter of fact” guy. But Delma put her fear aside and joined in the new drum group as a tamborim player (the small “finger” drum). She bought her own tamborim, a tamborim case, and a tamborim stick and joined in the tamborim group. I remember her as always shy and never believing in herself. She had rhythm but not much confidence. There is one thing that you should know about the tamborim: it takes many years to perfect. The wrist must move up and down in a hitting motion 16 times a measure which comes out to be about 3 hits per second – yes, per second. This is the “holy grail” of tamborim playing and many Brazilians who are familiar with the sound often give up when then can’t master this in a few weeks or months and with Delma, that was the case. When it came close to parading in Boca Raton in 2015, Delma ended up playing the shaker where she felt more comfortable. The shaker is simpler and less dangerous to play. Even though she did not play a major role in the bateria in the first year, it certainly felt major to her. She came up to me with those tears and thanked me for giving her the first opportunity to play in the drum corps. Since then, she has moved to the surdo or base drum which although heavier, is less stressful and easier to play. Instead of 3 times a second, it requires hitting the drum once every two seconds. But don’t let that fool you: playing that one note is not easy and takes a steady beat and lots of concentration. And Delma has both. Delma now plays as a second surdo and is a very special member of SambaLá and her story is unique like everyone in our school. She proves that with persistence, you can realize your dream to play music and perform and create something very special. And that she has. 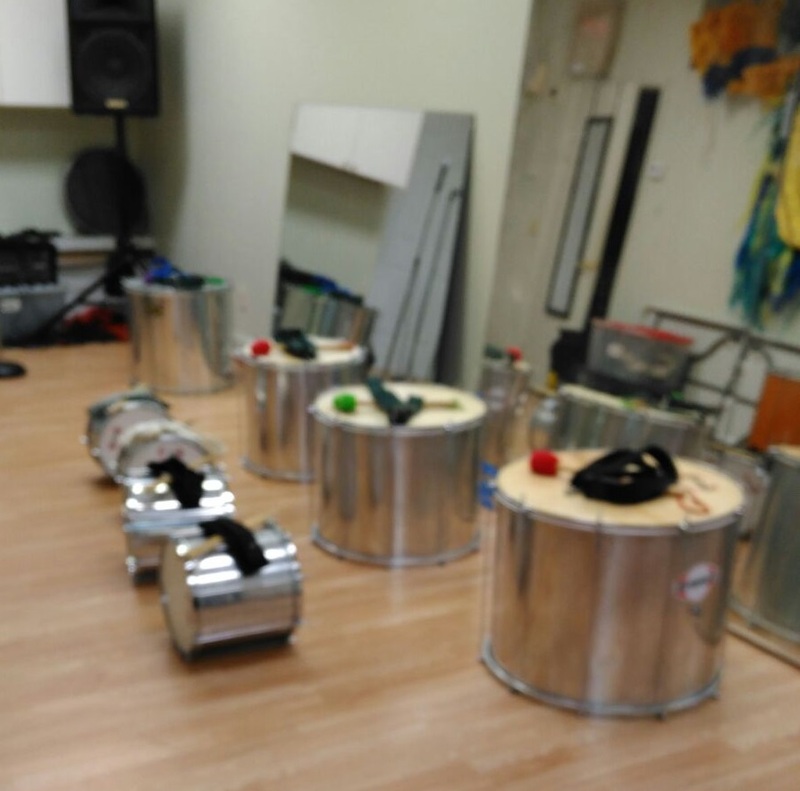 Delma’s love of her new samba school is illustrated by the photos she sends me from her phone of SambaLá’s rehearsal space with instruments on the ready. She helps with the instruments as well as helping out with costumes when carnaval rolls around each year. And by the way, Delma LOVES zumba and performs with her zumba around southern florida (see her in the banner photo performing zumba at the Brazilian Beat in 2016, and then immediately after, parading with her samba school). If you want to join Delma and the rest of the SambaLa bateria, you can practice with us every Thursday in our rehearsal space. Click here to find out how you can participate: Thursday Drum Rehearsals Page.